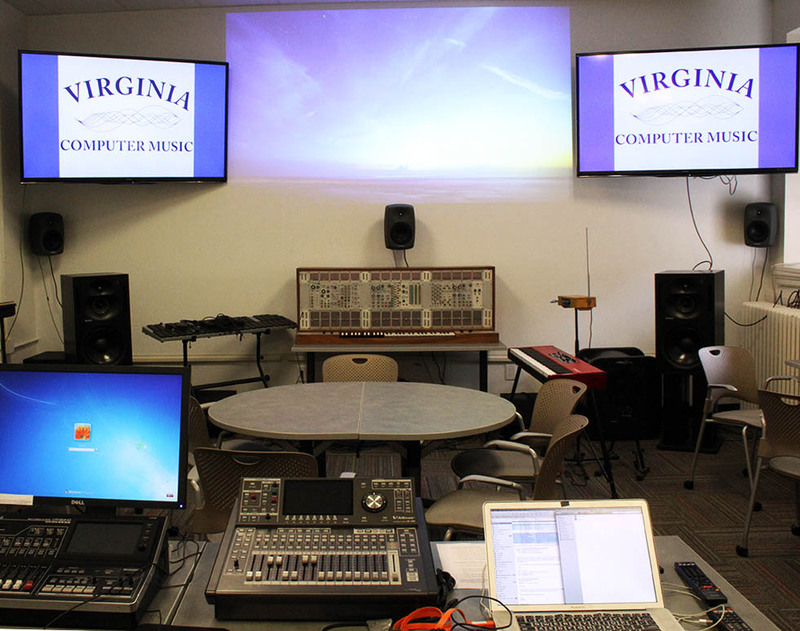 The Virginia Center for Computer Music (VCCM) is our primary studio for computer music teaching, a telematic stage, and a state-of-the-art research lab for multichannel audio, digital signal processing, telematics, multimedia, and human-computer interaction. The multipurpose use of the studio is supported by reconfigurable equipment and furniture thanks to a complete renovation of the facility in 2014. The room features 18.2 surround sound audio and 3-channel video projection. Audio and video run through independent digital mixers controlled from a central desk. A celing-mounted projector flanked by two 70-inch moveable flat screens can be served by a single computer or by three different sources offering great flexibility for classes and mulimedia research. Two Genelec 1037C midfield speakers and Genelec 7070A subwoofer`allow pristine stereo monitoring, and 8 matched Genelec 8050 nearfield speakers provide excellent monitoring for 8-channel sound. Eight additional QSC K10 speakers positioned at floor level can augment listening depth, or can be moved to accommodate unusual multichannel configurations. 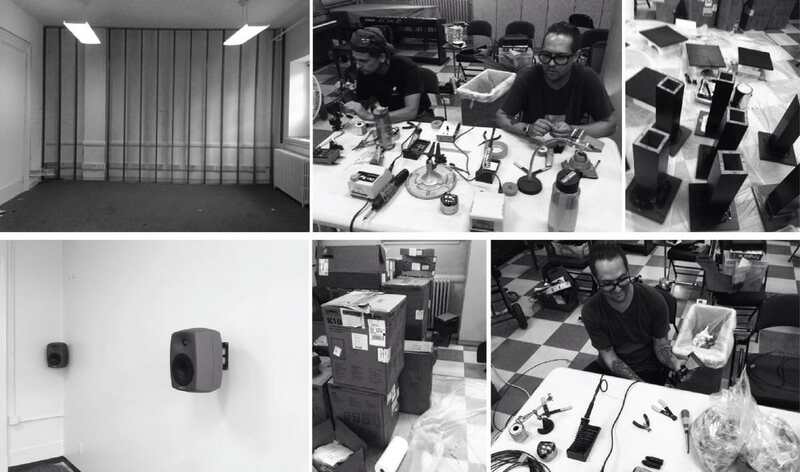 UVA Music has been a center for electronic music for nearly 100 years, and this history of technological innovation across periods is represented by the support of controllers from many different time periods. In addition to high quality modern instruments by Korg, Nord, Livid, QuNeo, Leap Motion, etc. 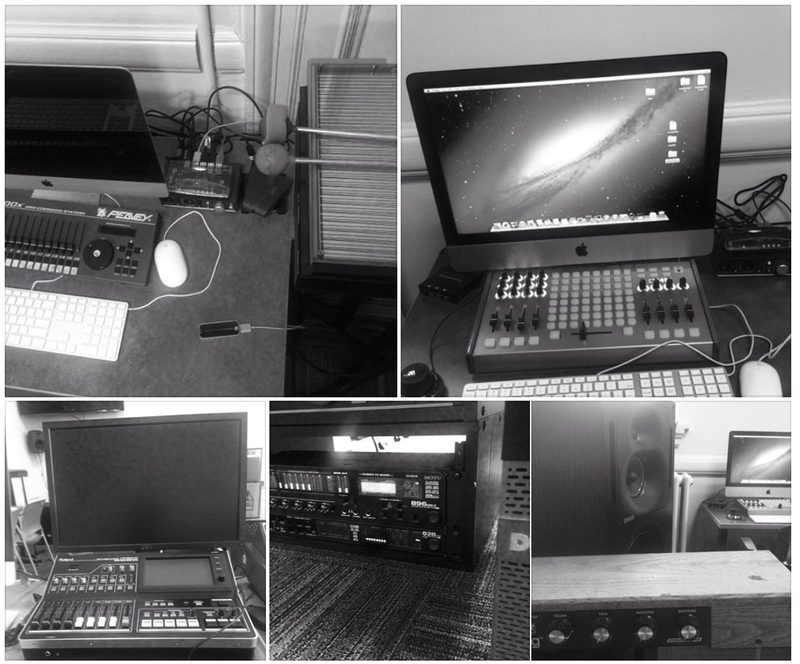 the VCCM houses a wide range of legacy electronic and digital controllers including an original 1970s Arp 2500, a custom-commissioned Max Mathews Radio Baton, a Theremin, an Axon MIDI guitar, a MalletKat, and others. Each of the 10 workstations supports core basic software such as Logic, Max/MSP, etc, and features different interfaces and audio-visual software. The VCCM itself has been an important part of the Music Department since 1987 when it was founded in Old Cabell Hall by Judith Shatin. a new VCCM in 104,582 quick and easy steps from Matthew Burtner on Vimeo. In 2014, thanks to a generous gift from the Cornell Foundation and matching support from the UVA College of Arts and Sciences, the VCCM was entirely redesigned and rebuilt. The renovation involved building a new ceiling, floor and wall, and a complete overhaul of the technology. 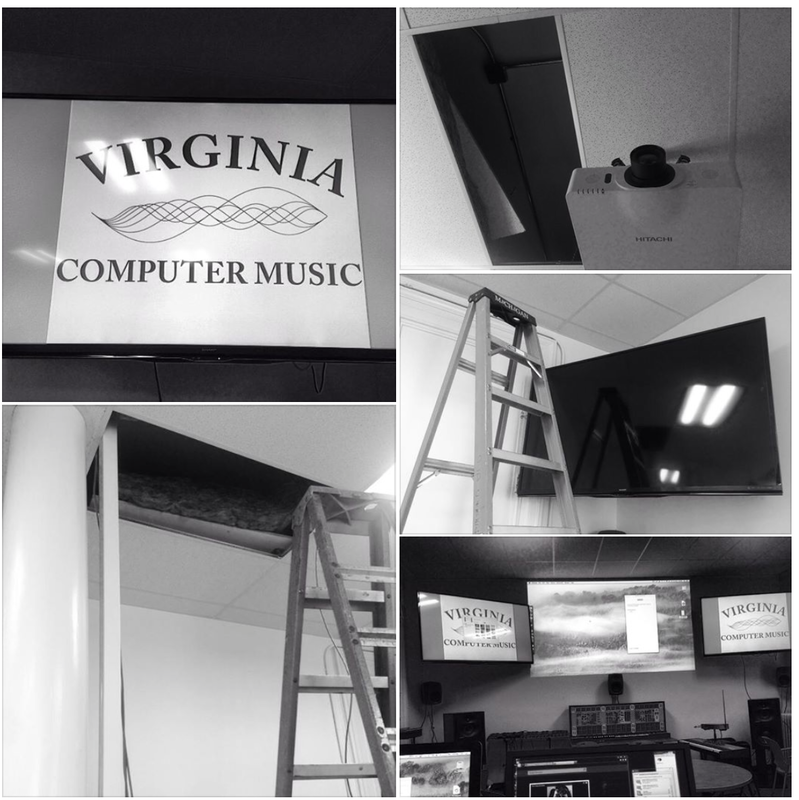 The images below show us soldering custom cables, wall-mounting speakers, building sound proof walls, restoring legacy gear, designing custom speaker stands, wiring 18.2 surround sound, hanging video screens, synth installation, digital mixer configuration, configuring new furniture, etc. The workstations are named after satellites and each is unique. Meet Ace, Newton, Tes and Sputnik for example. Telematic wiring through ceiling include video scalers, amplifiers, splitters, allowing digital imaging to be flexibly routed around the space. A powerful ceiling mounted projector and wall-mounted screens allow us to maximaze floor and table space in the lab.